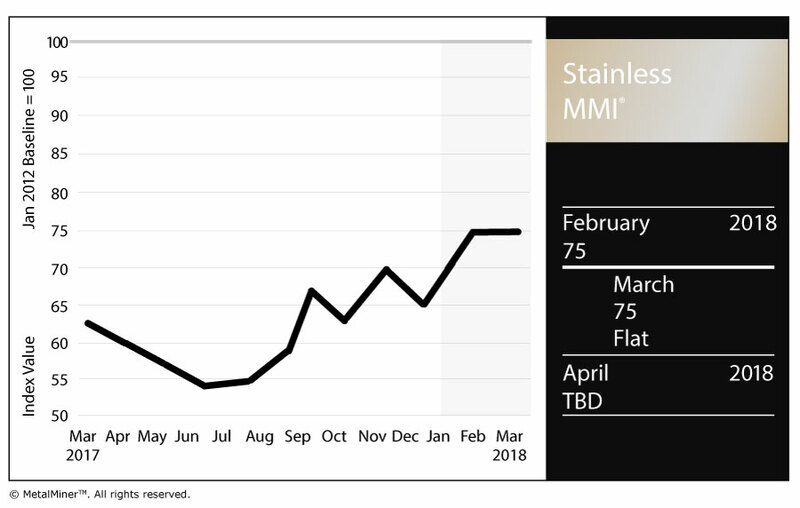 The Stainless Steel MMI (Monthly Metals Index) traded flat in March after a big jump in February. The current reading is 75 points. The index remained flat as LME nickel prices decreased slightly, while other elements of the stainless steel basket increased. Stainless steel surcharges jumped again this month, largely following the previous month’s LME nickel price movements. Nickel momentum appears to have slowed since the beginning of March. Prices retraced slightly. However, nickel prices remain in a strong, long-term uptrend. Like copper prices, nickel prices remain above the blue dotted line above. In December, nickel prices rallied and started to trade with a sharper slope, following the purple dotted line. However, these movements are often not sustainable in the long-term trend, and commonly correct. Therefore, nickel prices retraced to their long-term trendline, while trading volume remains supportive of the uptrend. Following the recovery in stainless steel momentum, domestic stainless steel surcharges increased further this month. The 316/316L-coil NAS surcharge breached its previous $0.8/pound ceiling. Stainless steel surcharges increased again rapidly. Therefore, buying organizations will want to look at surcharges to identify opportunities to reduce price risk either via forward buys or hedging. Tariffs Do Not End in the U.S. The European Commision prolonged the already existing anti-dumping measures on Chinese imports of stainless steel seamless pipes and tubes for another five years. The duties imposed initially in 2011 ranged from 48.3% to 71.9%. These duties gave European stainless steel producers — like France, Spain and Sweden — some breathing room. The review of these measures started again in December 2016 and showed the removal of duties on Chinese products would harm European producers. Therefore, the European Commission agreed to maintain the current duties on pipes and tubes used in the chemical and petrochemical industries for another five years. Although the Europeans have not enacted broad tariffs like the U.S. has done via Section 232 of the Trade Expansion Act of 1962, the issue of global overcapacity remains paramount as the E.U. continues to implement heavy duties on stainless steel products to limit imports. 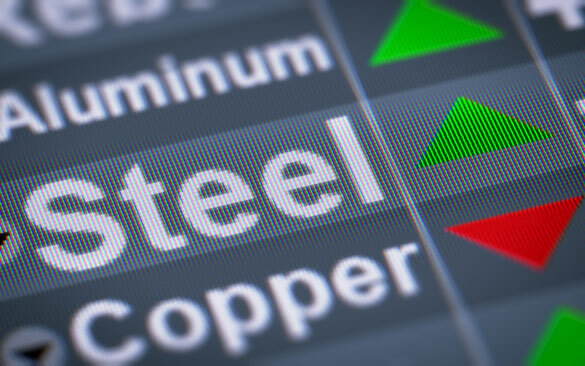 Stainless steel momentum appears stronger this month, recovering from its previous weakness. Buying organizations who have concerns about the Section 232 impact on the steel industry may want to read our comprehensive Section 232 Report, which includes new data.